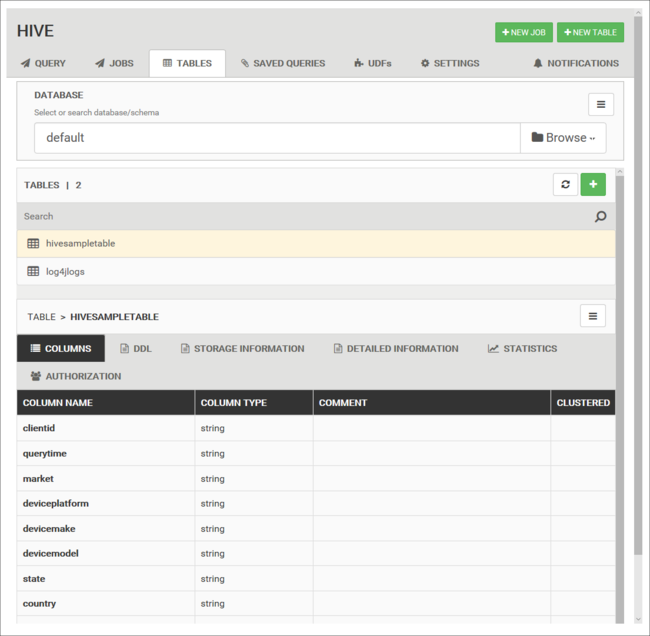 Learn how to run Hive queries by using Apache Ambari Hive View. 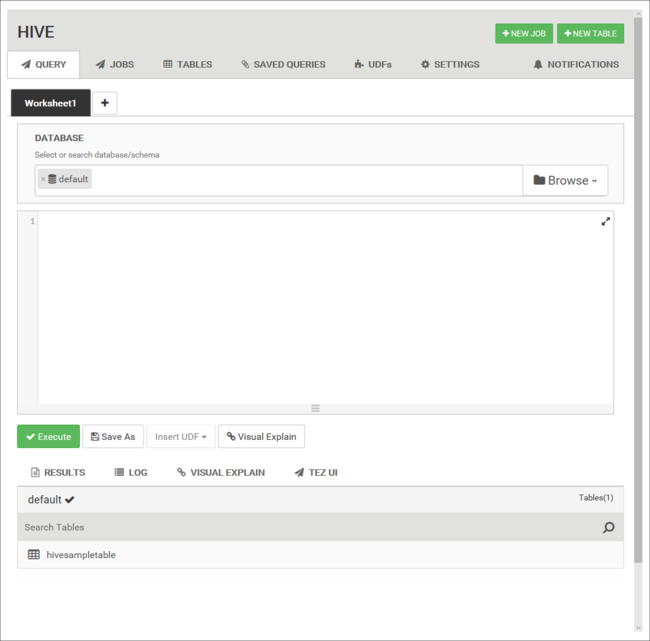 The Hive View allows you to author, optimize, and run Hive queries from your web browser. A Hadoop cluster on HDInsight. See Get Started with HDInsight on Linux. From the Azure portal, select your cluster. See List and show clusters for instructions. The cluster is opened in a new portal blade. From Cluster dashboards, select Ambari views. When prompted to authenticate, use the cluster login (default admin) account name and password that you provided when you created the cluster. From the list of views, select Hive View. DROP TABLE: Deletes the table and the data file, in case the table already exists. CREATE EXTERNAL TABLE: Creates a new "external" table in Hive. External tables store only the table definition in Hive. The data is left in the original location. ROW FORMAT: Shows how the data is formatted. In this case, the fields in each log are separated by a space. STORED AS TEXTFILE LOCATION: Shows where the data is stored, and that it's stored as text. SELECT: Selects a count of all rows where column t4 contains the value [ERROR]. Leave the Database selection at default. The examples in this document use the default database included with HDInsight. To start the query, select Execute below the worksheet. The button turns orange and the text changes to Stop. You can use the LOG tab to view the logging information that the job created. Download or save results from the Actions drop-down dialog box under the Results tab. To display a visualization of the query plan, select the Visual Explain tab below the worksheet. The Visual Explain view of the query can be helpful in understanding the flow of complex queries. To display the Tez UI for the query, select the Tez UI tab below the worksheet. Tez is not used to resolve all queries. You can resolve many queries without using Tez. The Jobs tab displays a history of Hive queries. 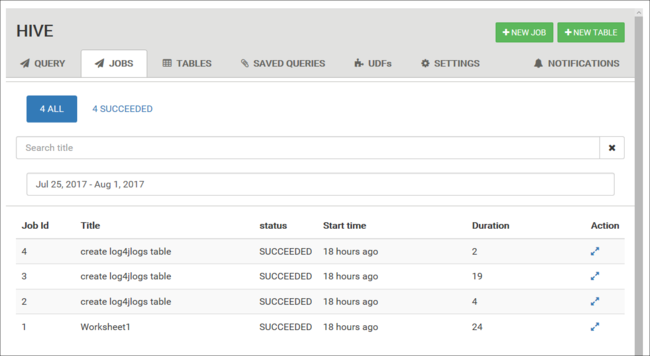 You can use the Tables tab to work with tables within a Hive database. From the Query tab, you can optionally save queries. After you save a query, you can reuse it from the Saved Queries tab. Saved queries are stored in the default cluster storage. You can find the saved queries under the path /user/<username>/hive/scripts. These are stored as plain-text .hql files. If you delete the cluster, but keep the storage, you can use a utility like Azure Storage Explorer or Data Lake Storage Explorer (from the Azure Portal) to retrieve the queries. You can extend Hive through user-defined functions (UDF). Use a UDF to implement functionality or logic that isn't easily modeled in HiveQL. Declare and save a set of UDFs by using the UDF tab at the top of the Hive View. These UDFs can be used with the Query Editor. After you've added a UDF to the Hive View, an Insert udfs button appears at the bottom of the Query Editor. Selecting this entry displays a drop-down list of the UDFs defined in the Hive View. Selecting a UDF adds HiveQL statements to your query to enable the UDF. You can then use the UDF in your query. For example, SELECT myawesomeudf(name) FROM people;. You can change various Hive settings, such as changing the execution engine for Hive from Tez (the default) to MapReduce.